Call for a firm stance and binding decisions against violation of human rights in Iran and urgent action to ensure the safety and security of the residents of Liberty and necessary arrangements to transfer them to Europe and the U.S.
On Monday February 24, in a conference titled “Iran-Human Rights-Western Policy, Urgent Action for Residents of Camp Liberty”, participants called for a firm stance and binding decisions against systematic and flagrant violation of human rights in Iran and urgent action to ensure the safety and security of the residents of Liberty. This conference was held by the invitation of the Friends of a Free Iran (FOFI) groups in Nordic countries at the Nobel Institute in Oslo. 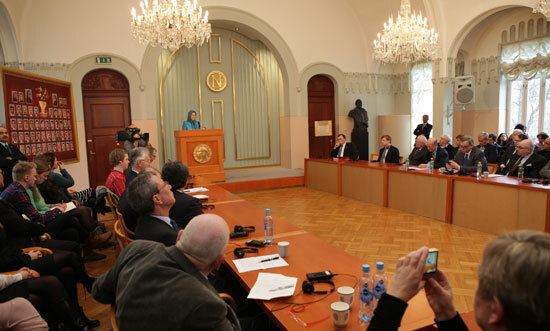 Mrs. Maryam Rajavi, President-elect of the Iranian resistance, Geir Haarde, former Prime Minister of Iceland, Patrick Kennedy, Member of the U.S. House of Representatives (1995–2011), parliamentarians and politicians from Norway, Sweden, Finland, and Denmark participated and spoke in this conference. Speakers condemned mass summary executions in Iran, siege and suppression of MEK (PMOI) members in Ashraf and Liberty, and Iranian regime’s meddling in the region, especially warmongering in Syria, that has taken an unprecedented scale especially after Hassan Rouhani, the new president of the regime, took office. They stressed that eight months after Rouhani’s coming to power, all signs once again prove the fact that this regime has no capacity to reform and change from within because every step toward real change will lead to its collapse and disintegration. Speakers emphasized that ignoring human rights violations in Iran, massacre of Ashraf and Liberty residents, and the regime’s meddling in the region with the pretext of nuclear negotiations is the most destructive message that can be conveyed to the regime. This message for the Iranian regime reflects a lack of seriousness by the international community that even encourages it to defy last November Geneva nuclear pact. Mrs. Rajavi added: “It is undisputable that in the nuclear talks, the mullahs’ regime took a step back under pressure and agreed to the Geneva agreement. The regime was furious that increasing public dissatisfaction along the dire economic situation and international sanctions may lead to public uprisings against the regime. But reducing the sanctions and giving concessions to the mullahs gives them time to contain their economic crisis and suppress increasing public opposition while advancing their nuclear weapons projects.” Rajavi emphasized Security Council resolutions regarding the regime’s nuclear projects must be fully implemented. Enrichment and the Arak heavy water project should be stopped completely and the Iranian rwgime must accept the Additional Protocol and unannounced inspections to take place. She added that while 116 residents of Ashraf were killed in the attacks of Iraqi security forces, seven people were kidnapped and 1375 were wounded and injured, and 18 people died due to medical siege, the United Nations and some governments were content to have a simple and superficial condemnation. Meanwhile no action to identify and bring to justice the perpetrators was taken and more importantly, no action took place to provide security for the residents and prevent similar tragedies. They have not even initiated an independent investigation. Previous Previous post: Can sanctions relief heal Iran’s economy ?